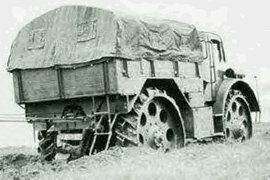 This German World War 2 era vehicle started life in response to the need for an off-road tractor and supply vehicle built for the mud and poor roads of the Eastern (Ost) Front. 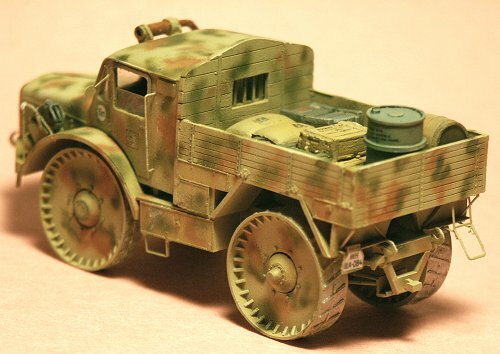 Radschlepper Ost (RSO for short) translates to "wheeled tractor East" The vehicle was designed by the famous Dr. Ferdinand Porsche of Volkswagen and of the Elefant panzerjäger fame, and is not one of Dr. Porsches best accomplishments. 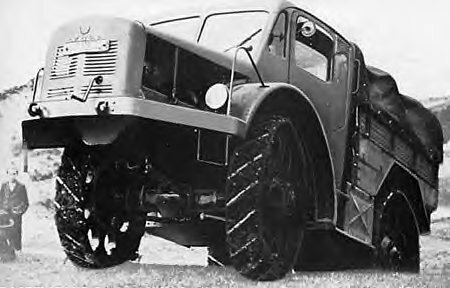 The vehicle was initially rejected though Hitler is reported to have ordered 200 built anyway. Production ceased at 100 though and I understand few or none served on the Ost front (the front it was designed for), several in the 1944 Ardennes Offensive. 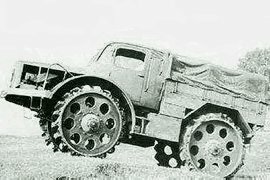 I surmise that the all-steel wheels would have made for a very uncomfortable ride. One source I read stated it performed poorly on icy roads. 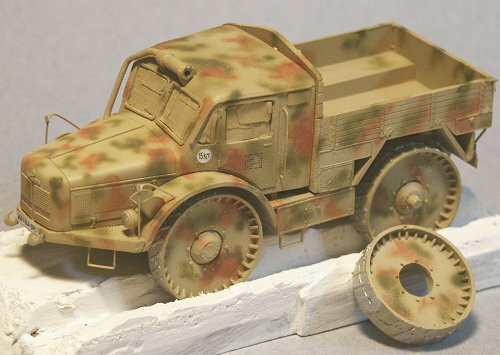 Many may already be familiar with the other German RSO tractor that was much more of a success and more numerous: the tracked Steyr RSO, or Raupenschlepper OST (Crawling Tractor, East), available in 1/72 scale by Modelkrak. 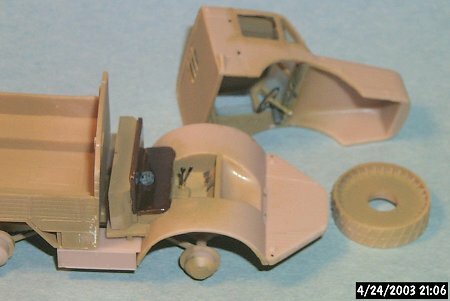 The RSO of this review as represented by ExtraTECH in 1/72 scale and was a tracked vehicle of four four-wheel-drive roadwheels. 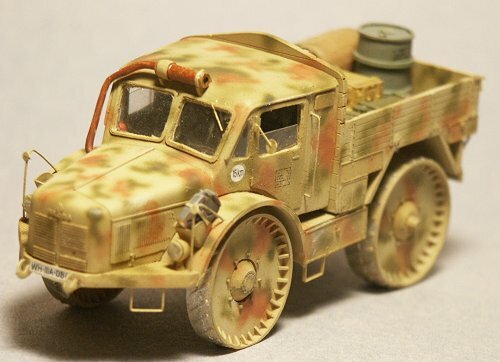 The only other model kit of this vehicle I am aware of is from TP Models, #TP7273, also in resin. The kit comes in 24 well-molded tan resin parts, and about 42 etched brass parts. 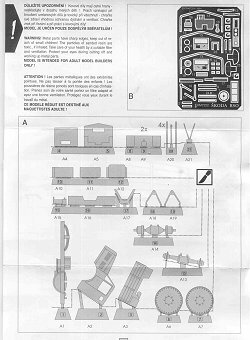 Doug Chaltry wrote a preview of this kit where I refer you for a breakdown of the parts. Removing the pour plugs and clean up was not difficult. Most parts could be scored with a razor saw or knife and snapped off. I noted no air bubbles and the edges were crisp. There is also a clear sheet with outlines for all six windows and dashboard dials. The all-steel wheels look like the metal tread is a bit shallow but is not unreasonable. As seen above, the instructions I think are superb, about the best of any resin manufacturer I have seen. My commendations to ExtraTECH for this. The instructions even tell you where to cut off the pour plugs. 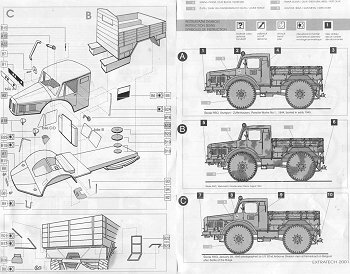 Despite only 100 being built, in the photos of three or four different vehicle I have noted some variations, such as exact placement of the steps and such. I would not worry if your model does not exactly match the photos. I used cyanoacrylate (Super) glue for assembling all the parts. But be careful with placement of the parts as super glue sets very quickly! 5-minute epoxy or white glue may be better in some instances for selected parts. Note that the rear wheels (parts A6) are wider than the front (parts A7). The tread pattern points down and inside when looking at the vehicle head on. The wheels have the bolts molded to both sides of the wheel. I found the inside bolts needed to be shaved off for the wheel to sit flush to the hub. The detail on the outside of the wood bed is excellent, though unfortunately this detail is missing on the inside of the bed. We can either scribe the wood plank lines in and add the bolt detail, add a tarp (canvas) over the bed using the brass supports included on the etched fret, or pack the bed up with cargo or figures. Yes, the vehicle muffler mounts on the cab roof. Perhaps this keeps it from fouling with mud and snow? Overall fit was very, very good. Little filling and sanding was needed. The brass parts were clearly marked, and bent into shape well. A clear film backs the etched-brass dashboard with the dial markings on the film. Visibility into the cab is difficult when done; I should have saved this piece for an open-top truck where it could be better seen! The flat etched-brass grab handles may be replaced by brass wire bent to match the kit parts. Matching holes will need to be drilled in the cab and fenders for the handles. My windows were installed with Kristal Klear, a white glue-like material that sets clear and matches the refractive index of the window plastic (i.e. dries so we cannot easily see it on the plastic). If you lower the side windows so as to better see the cab, make note that the windows appear to only lower halfway due to the small size of the doors. Based on photos, I think the etched-brass rear ladder is too long and is better shortened by one rung. After washing and allowing drying the clear windows were masked with Tamiya masking tape. The Tamiya Panzer Yellow and Buff acrylic paint colors were blended to achieve a good scale-effect color and thinned with alcohol to a consistency of milk. With 15 psig on the regulator three very light coats of paint were applied, waiting about five minutes drying time between coats. At this stage its important to hold the airbrush close (about 2 to 4 cm maximum) so the paint does not dry in the air and form a rough spotty, orange-peal like surface. The camouflage scheme was added next using Vallejo acrylics, again thinned well but with tap water. For a fine soft-edge pattern the airbrush nozzle was held no more than 1 cm, using both hands to be as steady as possible. After the paint had dried for about a half-hour a coat of satin finish varnish sealed the paint for the upcoming weathering. The model comes with water-slide decals for three different vehicles. 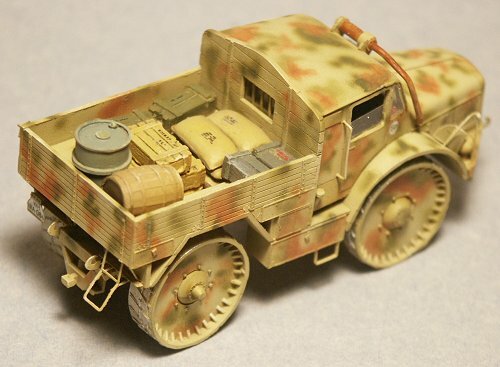 Besides license plates with the decals, there are two sets of vehicle specification-stencils commonly seen on the doors of Wehrmacht trucks. These markings are rarely offered and its great there is an extra set for your next truck. The decals applied well with a little gloss-coat down first and setting solution, then another gloss coat to seal & protect the decals. Following a gentle washing in warm water and dish detergent, an acrylic dullcoat was applied. Weathering followed with a light coat of dust colored paint. Eventually more weathering will be applied when the model is affixed to a diorama base. My great thanks to Doug "Everglades" Chaltry, and to ExtraTECH Limited for this kit. I did not find a lot of information on this vehicle, particularly compared to other German WW2 vehicles. Besides the websites below you may have luck with a web search on Skoda RSO. http://www.ipclub.ru/arsenal/angar/WWII/army/germany/gerarmors/SkodaRSO.htm A Russian language website with nice line drawings. 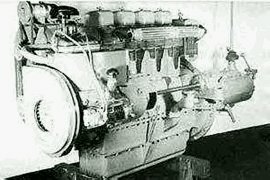 http://members.rogers.com/gparada/votw/spec.htm Achtung Panzer website. A good site on vehicle history.